In March 2013 the Leiden University Libraries, with the support of the Cooperative Maritime Funds and the Friends of Leiden University Libraries, acquired an unknown newsprint of the Spanish capture of the city of Salvador on the Bahía de Todos os Santos (All Saints Bay) in Brazil (1625). 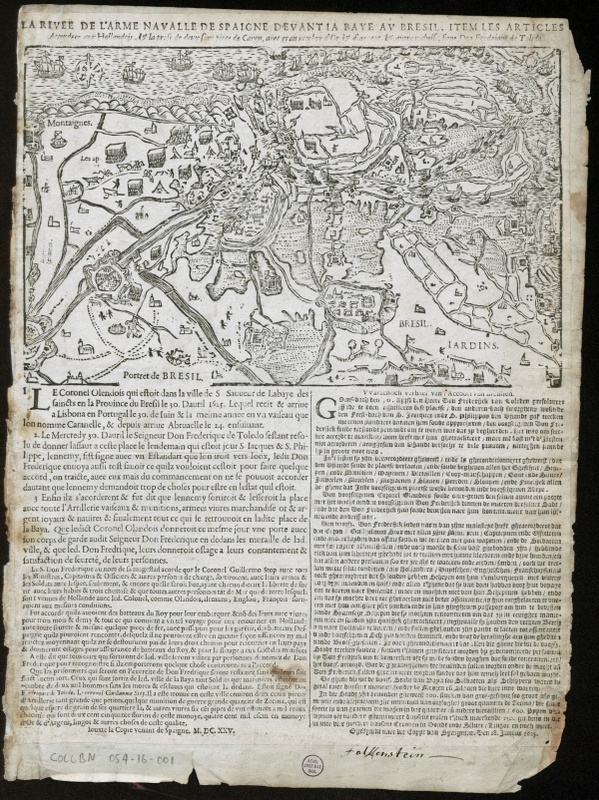 This broadsheet consists of a wood-cut map and a printed legend in French and Dutch. It is copied after a Spanish original. A closer examination of the map, however, has led to the discovery that the woodcut map has nothing to do with the Bay of All Saints. For the visualisation of the capture an older woodcut of the siege of Sluis in 1604 was re-used. No other copies of this newsprint are known. As far as we could trace no copies of the Spanish original have survived either. Furthermore, no copies are known of the original wood-cut map of the siege of Sluis. Since the Dutch are consistently referred to as ‘the enemy’, however, it may be assumed that the newsprint was printed in the Southern Netherlands under Spanish dominion. The woodcut of Sluis that was used shows strong topographic similarities with the Carte figurative de l'Escluse avecq les villes et lieux circonvoysins by Jacques Horenbault, published in Ghent in 1605. The woodcut must have been made during or shortly after the siege of Sluis in 1604. Many copper engravings of this siege have been published, but until now a woodcut was unknown. For the re-use of the woodcut the original placenames were erased from the woodblock. This was done inexpertly, however, so traces remain of the original names. Finally, some Brazilian toponyms were printed in the map with the letter press, which led to a further camouflage of the original map of Sluis.